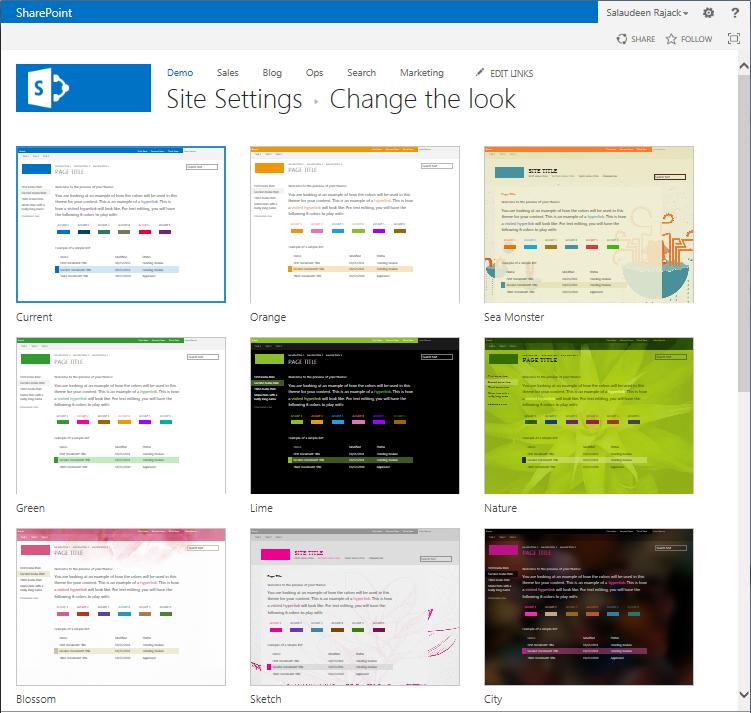 Themes are the quick and easiest way to apply branding to SharePoint sites. Themes got changed over time in SharePoint's history. 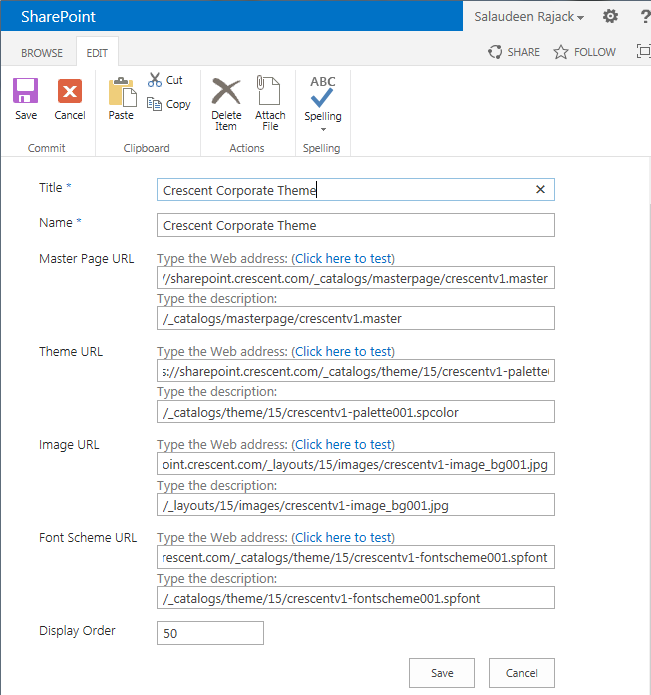 Now in SharePoint 2013, Themes are redesigned as "Composed Look" feature. As it sounds "Composed" look, it simply defines theming by combining design elements: Master page - AKA site layout, Color theme, Font schemes and background images. 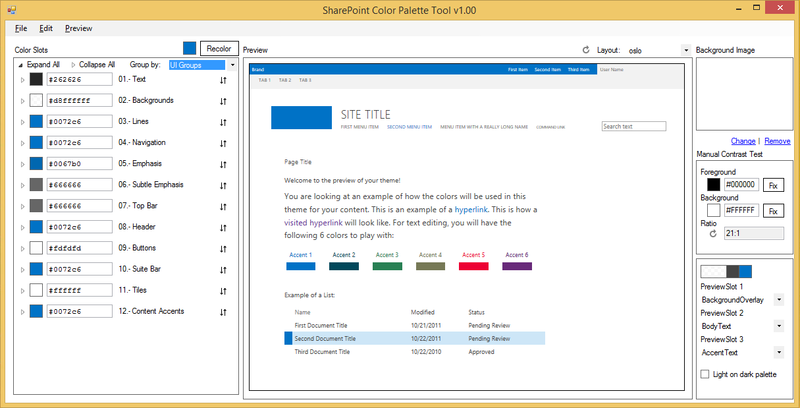 No more thmx - PowerPoint themes which was introduced in SharePoint 2010, these themes can't be used in SharePoint 2013. 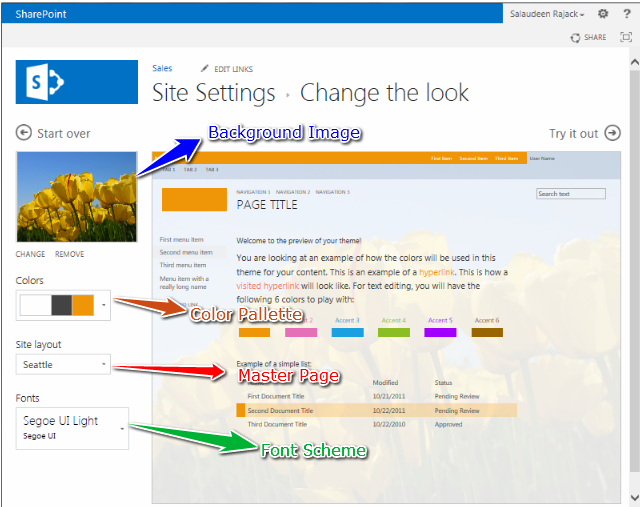 You can get the option to change SharePoint 2013 themes via "Change the Look" link from the Site Settings menu. Same is available under Look and Feel group of Site settings page. Change the look wizard and shows a thumbnail view of available designs. These designs are defined in a special list: "Composed Looks". Once you confirm by "Yes, Keep it", the new look and feel is applied to your SharePoint 2013 site. Step 1: Create and upload theme elements: Master Pages, spcolor, spfonts, etc. to SharePoint. Step 3: Apply theme: You can apply theme from Site settings - Change the Look. You can also apply theme programmatically. 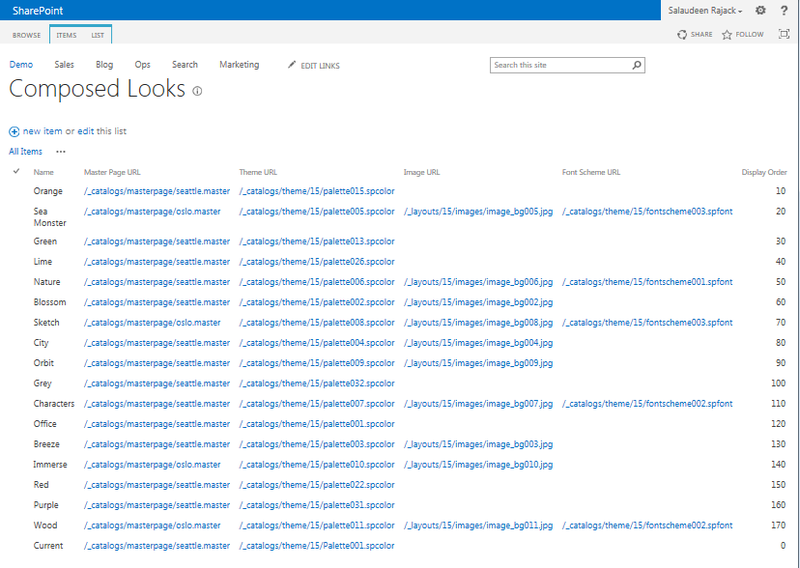 As illustrated above image, To create a custom composed look in SharePoint 2013, We need these artifacts ready. BTW, These design elements are reusable - Meaning can be used in any number of custom theme (or call it "Composed Look")! Master Page URL - A reference to either a default or custom master page which is already uploaded to the master page gallery. This master page must accompanying a .preview file with the exact name - (with the .preview extension instead of .master). Otherwise, you won't get composed look preview. Color palette is nothing more than an normal XML file with a .spcolor extension. By default, color palette contains 89 Color slots of Key-Value pair. Where the first two digits: 7F represents the Transparency (optional) and rest for HEX value of the color. This tool also lets you open a OOTB color palette and modify the colors. Once you built your customized color palette, You can upload it to the Theme Gallery (Site settings >> Themes >> 15 (Shortcut: /_catalogs/theme/15/ ) and use it in a composed look. This gallery generally resides on the root web level and has theme files, Color palette and font schema inside 15 folder. the .spfont file in your Composed Look item. Please note: The .spfont and .spcolor files must be in the /_catalogs/theme/15 folder, NOT in a sub-folder! Background Image (Optional) - The image that will cover the entire background of your SharePoint pages. Once you have all these artifacts ready, The next step is: Making an entry in Composed Looks list to pack it as a theme! As the name suggests, This library contains all composed looks. This list actually contains master page URL, image URL, theme(color palette) URL, Font Scheme URL and Display Order. So, all of them together is a theme. From there you simply fill out the form giving the title, name and URLs to your custom Master Page (which may have custom CSS files linked inside) and other artifacts. Once you have the entry for your theme in this list you can see your composed look/theme available on "Change Look" page.